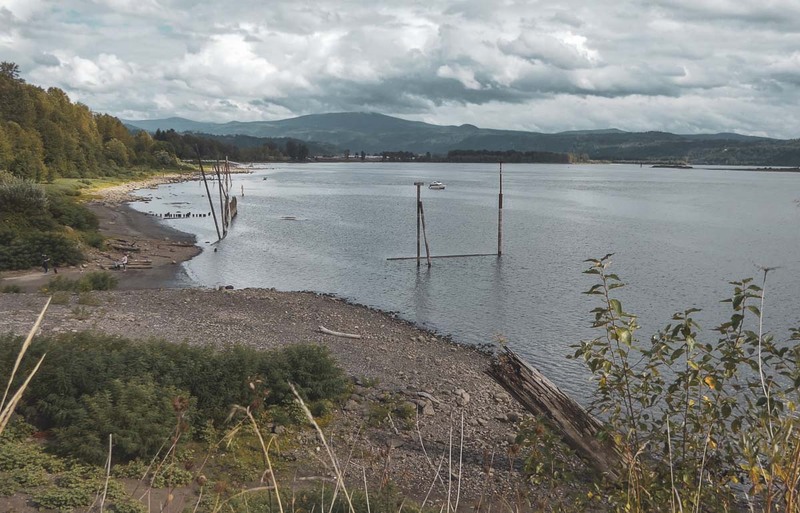 WASHOUGAL — A short 20 minute drive from the heart of downtown Vancouver, the city of Washougal hosts a park covering close to a mile of Columbia River waterfront. Amidst 170 parks in Clark County alone, Waterfront Park in Washougal brings many updated amenities and unique activity opportunities to the area. Constructed in 2016, Waterfront Park sits adjacent to Marina Park and the waterfront marina, and is managed by The Port of Camas-Washougal. Together, these parks make-up what is often referred to as Washougal’s Waterfront Park. The park includes over a mile of walking paths, motorized and non-motorized boat launches, restrooms, picnic tables, a large covering, and beach access with ramped descents to the docks and waterfront. Hundreds of boats can be seen moored at the marina, which is visible from either side of the park area. Built onto the docks themselves is the Puffin Café; a small restaurant offering drinks and caribbean food. The park is open to leashed pets as well as cyclists, roller skaters, joggers, and welcomes canoeing along the waterfront. Parking is available for vehicles towing boat trailers or campers. With all trails and paths ADA accessible, the park allows for anyone to enjoy the amenities; the largests of which is the viewing area on the eastern side of the newer portion of the park. Designed to look like a compass point, the lookout faces the eastern Columbia River Gorge, and contains informational stations where visitors can learn about the Columbia River environment and salmon populations. Artwork by local artist Malo Hasselblad, adorns the cemented area of the park. The artist fabricated a stainless steel salmon to be inlaid in the ground, back in 2015. Perhaps the most technologically advanced and expensive pieces of the outdoor facility are the solar powered restrooms and rain gardens. The Port hopes to use these “green” features, along with informational signage, to educate visitors on how they can more positively affect the environment. Towards the center of the newest section of the park, a 600-square-foot picnic covering is available for events and parties. The space can be reserved through The Port of Camas-Washougal’s site by seeing the parks fee schedule. In between the two halves of the park, sits the recently finished Black Pearl on the Columbia. The over 12,000-square-foot event venue will begin renting it’s space for community events soon, with rates now available on it’s website. For more information on the Washougal Waterfront Park, or to inquire about upcoming events, boat launch and marina access or event reservations, go to the parks page on The Port of Camas-Washougal’s website or visit their Facebook page. Subscribe to our newsletter to receive updates and invitations to community news and events.